Stuck looking for the right analytics tool? If you’re a business owner, digital marketer or business analyst, you’ve probably been there. Sometimes you jump into an organization and you’re forced to work with the analytics solution already in place. If you are lucky enough to choose it on your own, don’t waste this opportunity and get the job done right. Why is it so difficult to choose the right analytics tool? One of the hardest things people do is making decisions. The more decisions you make, the more tired you are – this is the phenomenon called “decision fatigue”. If you’ve ever gone shopping for dinner after a long day at work and can’t decide on chicken, fish or veggie, you know just how hard it is to make choices when you’re tired. We’re not only tired, we also struggle with information overload. Too much information paralyzes us and stops us from reaching the end of the decision-making process. If you’re reading this blog, there’s a good chance you are responsible for strategic choices at your organization. And if you want to improve your website’s performance, one of the decisions you face is choosing a web analytics tool. There are several solutions that deserve your time and consideration in the vast world of analytics. Choosing one means a long-term commitment. It involves time, money and human resources, so you really don’t want to mess up. Besides the things already mentioned, there are many other issues to discuss and questions to be answered. Decisions don’t have to be scary if you know what you are looking for. How can I be sure that I make the right choice? Making a good decision depends on two things: information and process. 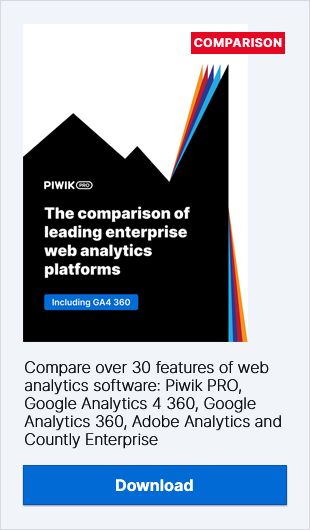 For information about which analytics choice – Piwik or Google Analytics – is right for you, we recommend having a look at our whitepaper on that very subject. You can download it here. The decision process is a tougher problem. Most of us make decisions without thinking about how we do it. A structured approach to choosing an analytics tool can help you find the best solution for your business. Psychology Today offers a brief review of decision strategies developed over the years. Some are more complicated, but others are not. It’s worth going through these models as a team and deciding which one to apply. Let’s use the decision process model called additive difference to compare a few of the important issues you need to consider when you choose an analytics tool. The idea is to pick criteria and compare two solutions, then give the solution that best fits the criteria a point. Once the points are added together, you can see which solution meets more of your needs. Piwik PRO: Compliant with EU and USA data protection regulations. You are the owner of your data, which means no third parties access it for data mining. Recommended by leading European privacy advocates. Result: It’s fair to say that 100% ownership of data is an edge, particularly for such industries as banks, telcoms, or the government sector. With its on-premises model Piwik PRO is a reasonable choice for institutions dealing with huge amounts of sensitive data. Google Analytics: The code can’t be modified, but Google is the market leader (over 80% share) and offers a very large catalog of add-ons because of its sheer popularity. Custom dashboards can also be implemented. Integrates with Google products, providing flexibility and power. Result: While Piwik PRO is growing rapidly and offers integration with the most popular e-commerce platforms, it still needs time to catch up to Google Analytics. Piwik PRO: Open-source solutions are never discontinued like commercial ones. Also, the community of passionate and committed Piwik developers is growing with every day. Piwik PRO support offers enterprise-grade assistance for those who need it. To learn more about how open-source software satisfies the needs of even the most demanding enterprises and organizations, check out this blog post exploding the myths of open source software. Google Analytics: Google is a massive company which is committed to its products, no doubt. And there is a tremendous amount of content about GA all over the internet. But every piece of software it produces is proprietary, which means users are limited by whatever Google does with its applications. If Google stops supporting GA tomorrow (maybe not likely, but also not impossible), you’ll need to start over and find something new. However, there is a very powerful community forum and lots of free documentation. Result: If you want a solution that gives you independence from the vendor, an open source tool is the one to select. However, at the moment GA does have a larger community and accessible support. Check out the set of 10 issues that every business owner should consider before making the final enterprise-level analytics software decision. Of course, there are many different criteria you use when making these decisions, and we certainly wouldn’t suggest that GA is a bad tool. It might even be the right one for your particular organization. You can also take a look at this comparison of the features and benefits of Piwik PRO and Google Analytics. But before you take the decision about which analytics solution to use, you should be careful to use a method which helps you make the most optimal choice for your enterprise’s goals. Your team should gather as much information as possible, select a way to make a decision, prepare the process, and then arrive at a final choice. If there’s something we can do to help you, just send us a message via contact form and we’ll be happy to offer our advice.